Securing your property with a lock and chain is a great way to keep unwanted elements out. However, sometimes someone, such as a utility company, may need access through a chain-locked gate. It is simple to use two short pieces of chain and two locks. Each lock acts as a link in the chain and provides easy access to anyone who has either key. This method works particularly well for gates to fences and yards. Insert the shackle or arm of one lock into the first link of each chain. Close the lock to secure the links together. You should now have one long chain, with one lock at the center. Wrap the chain around the post and pole where the gate of the fence closes. The first lock should be centered on one side of the fence. The loose ends of the chain should be hanging on either side of the other side of the fence post. Slide the shackle or hook of the second lock over the links at the two loose ends of the chain. Close the lock to secure the chain into an unbroken loop. When selecting your chain and lock, be sure the shackle will fit easily through the links of the chain. The shackle is the U-shaped piece of a padlock. 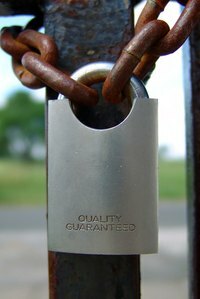 If your chain and lock will be exposed to weather, be sure to select a padlock that is weatherproof to prevent rust.